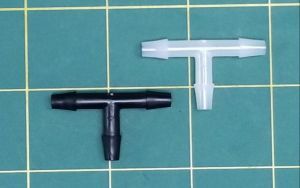 OSE Large "T" style water multi barb fitting. If you are looking for a strong, yet super light weight fitting, this is the one. It weighs in at less than .5 grams. This fitting will work with either the 1/4" or 9/32" OSE silicon tubing. Measures approximately 1.50" (38.6mm) from left to right. Measures approximately .87" (22mm) from top to bottom. Inner diameter: approximately .120" (3.05mm).